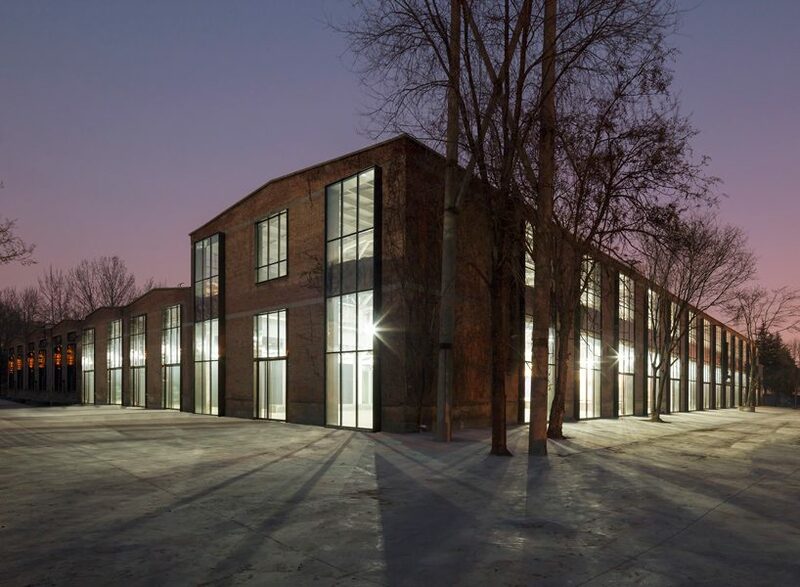 superimpose architecture has designed an exhibition center for changzhi, a third-tier city in shanxi province of china. under the prevailing economic and urban transformation in china, changzhi faces suburbanization, which will soon remodel into a new CBD. 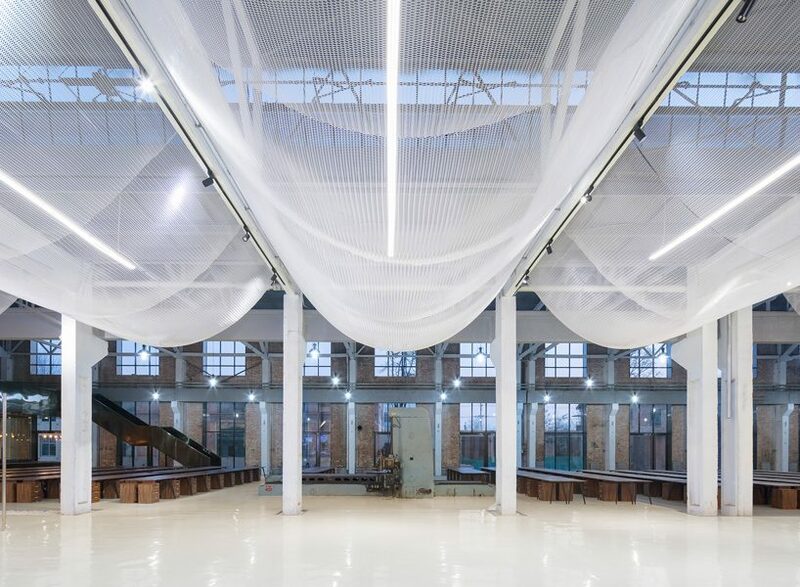 the main design challenge for the design studio has been to either erase the current city fabric or try to preserve and revitalize the province’s fewest remaining industrial heritage and transform into a ‘cultural hub’. 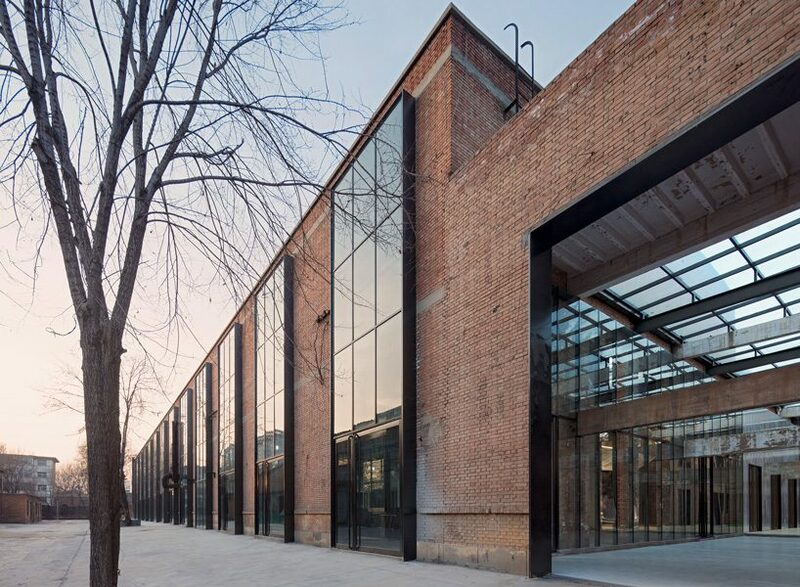 as part of this, the project team has regenerated the first and the largest of the former factories into the ‘changzhi city expo’, which will host as an exhibition center, a government-meeting center, office spaces and an auditorium. chinese based studio superimpose architecture’s main design strategy for the ‘city expo’ has been to investigate the original distinctive elements of the factory and insert minimum architectural interventions to restore the spatial quality and simultaneously provide the required programmatic functionality of the exhibition. key features of the factory are the repetitive structural frames, the unique and wall-painted propaganda slogans, and rhythmic facade openings. 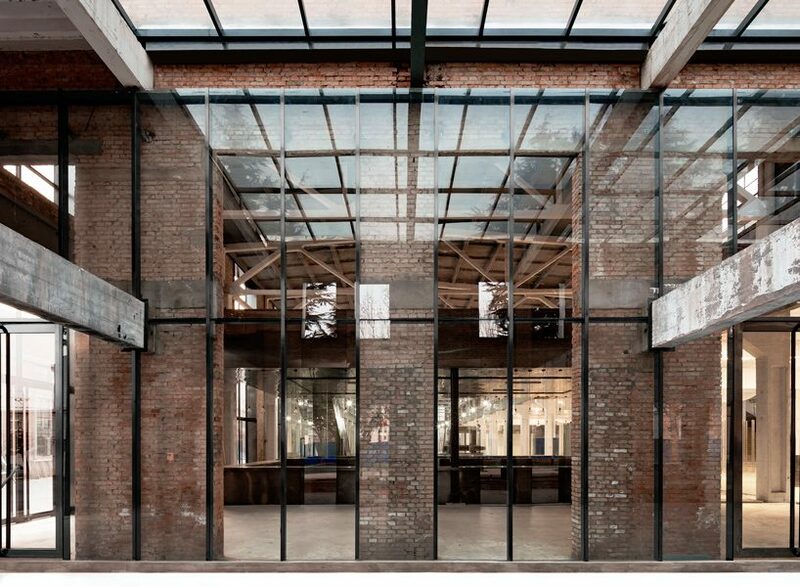 the original brick facade is robust, rhythmic and designed for industrial purposes. 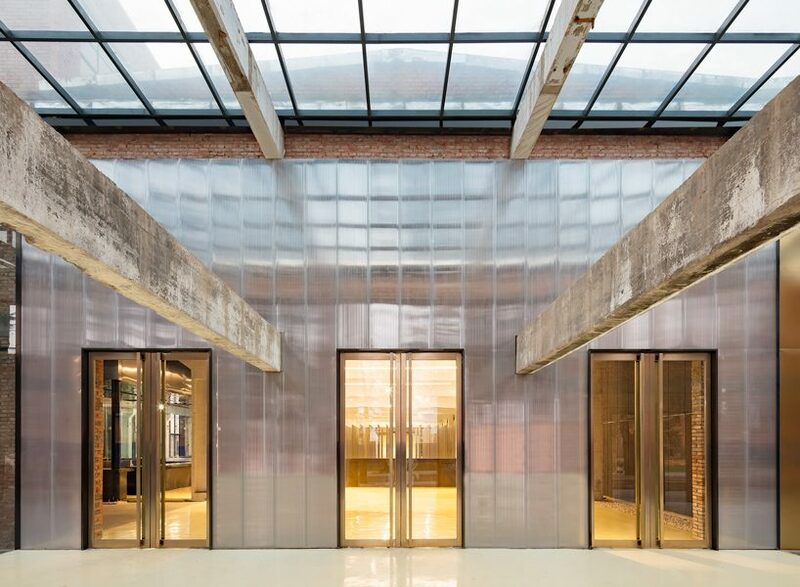 to adapt and accommodate the current needs, a level of intervention is introduced to the facade. 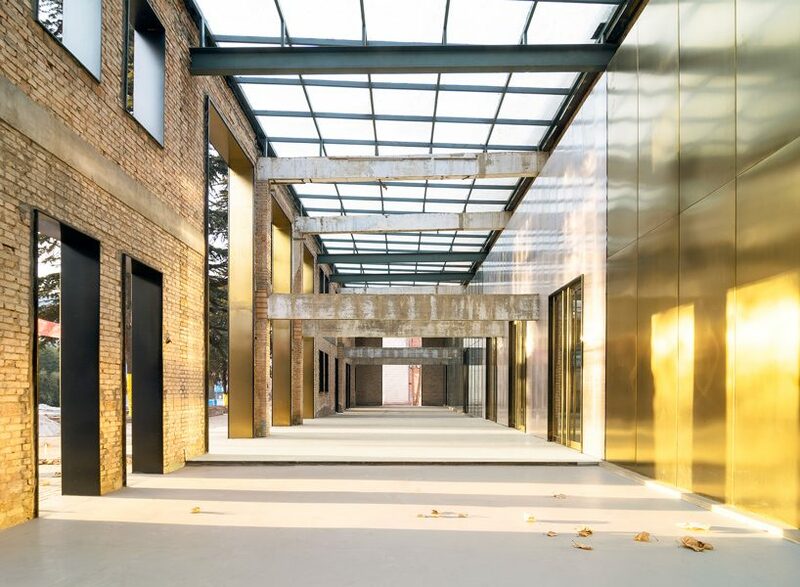 the original load bearing factory facade has been concealed by an office extension on the east side of the building which has a comparatively denser grid wall structure. 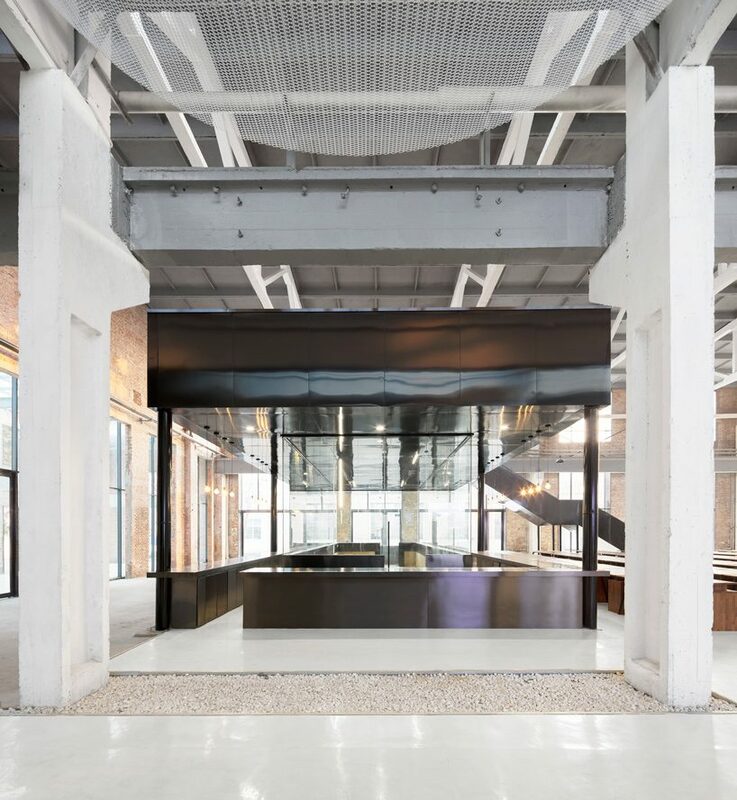 superimpose has proposed a veranda by removing all the interior subdivisions of the extension, revealing the original factory facade and has made this into the main entrance of the exhibition center. the essence of the extension is kept by framing the original windows and doors without any infill. the glass roof veranda offers a sequential arrival space, which pronounces the main entrance and promotes accessibility. 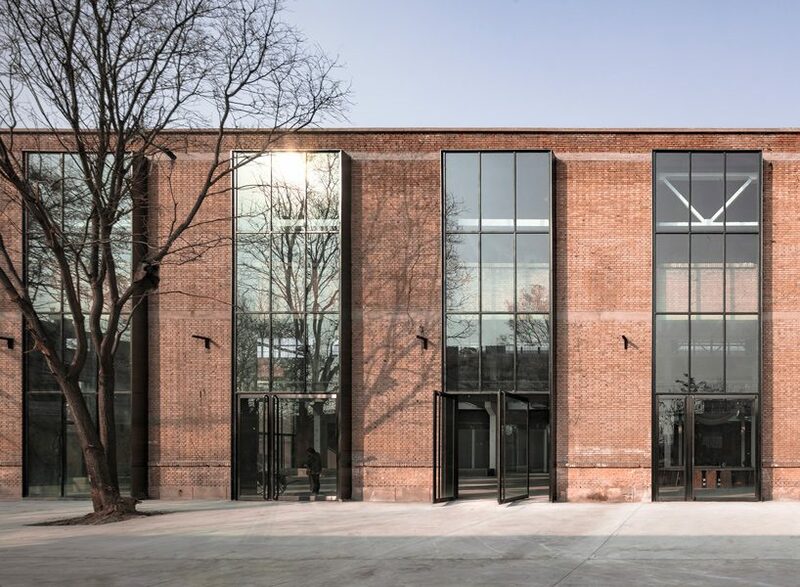 the repetitive nature of the south facade is emphasized by replacement of protruded black aluminium frames and clear double glazed windows, with operable pivot doors for outdoor events. 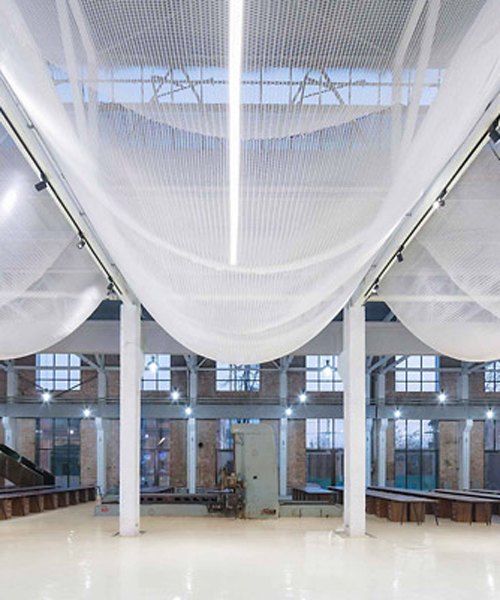 for the interior, superimpose has proposed a white ‘veil’ metal mesh hung from the ceiling. the ‘veil’ is hung in between the repetitive beams and columns, articulating the design’s rhythmic structure. 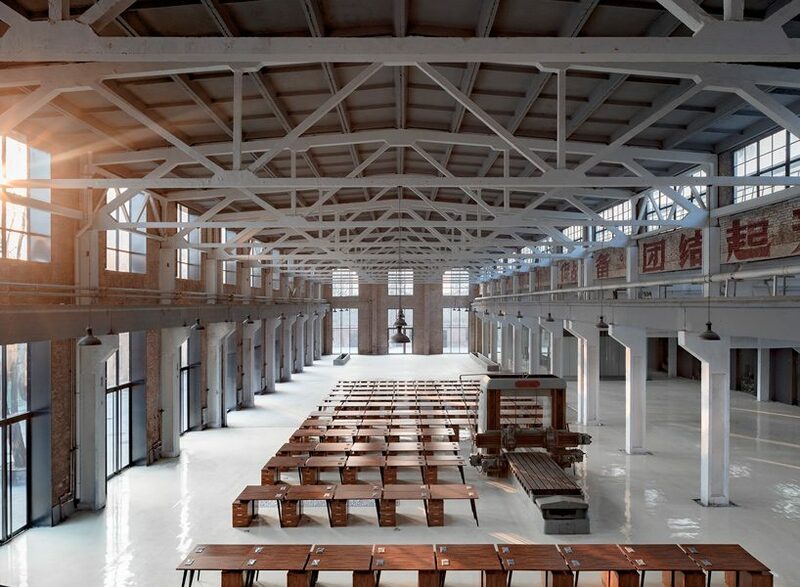 the application of the ‘veil’ helps softening the industrial space. it filters the daylight from the roof light and defines a human scale within the vast space. light fixtures are placed in between and above the mesh, creating multiple light configurations for different occasions during the evening. a mezzanine level is strategically introduced to utilize the double height space. while the ground level is for public, the mezzanine level retains privacy for open plan workspaces, library and enclosed meeting space. superimpose architecture’s ‘re-veil’ started with a vision to challenge urbanization in the fastest growing country in the world. the project is a benchmark for similar cities in china, which are undergoing prompt urban planning decisions with cultural heritage. superimpose wants to celebrate cultural heritage and create places for the people and property that simultaneously helps clients and governments to reach their targets. one of the historic propaganda slogans in the changzhi expo states in big red characters: ‘大胜利’ which means, big victory. the chinese design studio hopes that the changzhi expo is a big victory, leading to plenty more successful heritage transformations to come.